One in every four farmer respondents across all regions of the country said low prices of crops was their most pressing problem. Fact Check: Before ‘Oumuamua visit, did an interstellar object hit Earth? 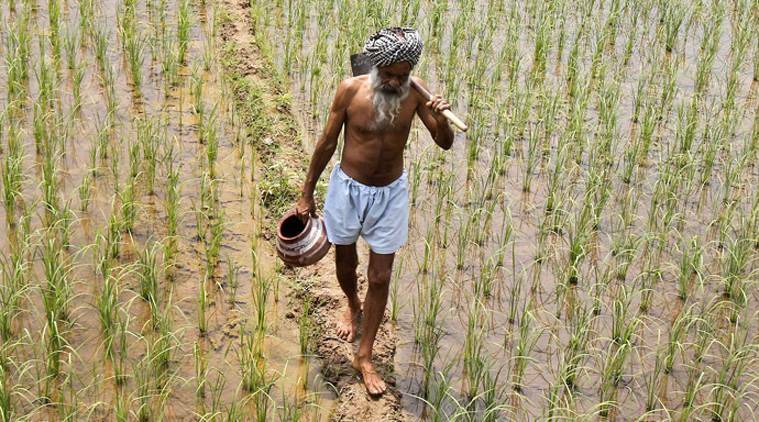 The current crisis in India’s farm sector is perhaps the worst in the last 15-odd years. The Lokniti-CSDS survey (Part 1 was published on Wednesday) has a separate section on farmers’ issues, intended to throw light on their concerns and problems. One in every four farmer respondents across all regions of the country said low prices of crops was their most pressing problem. Only a little over a third of all farmers (37%) reported satisfaction with the rates of crops set by the government — nearly three farmers out of every five (58%), on the other hand, reported significant levels of dissatisfaction with the rates. Only 27% of farmers said they sold their produce to the government purchase centre; nearly double that percentage — or half of all farmers — said they sold it to middlemen. 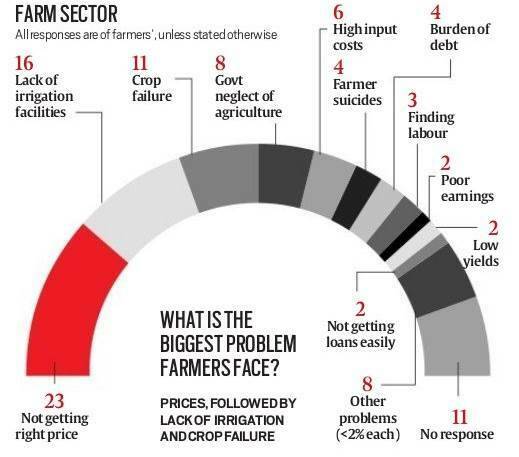 A majority (53%) of farmers said Prime Minister Narendra Modi’s government had done a poor job in addressing their concerns. However, the percentage of farmers who said the central government had done a good job was not insignificant either (41%). Interestingly — and in what could be seen as a straw in the developing political wind — an equal percentage of farmers across the country identified the BJP and the Congress as the party that takes care of farmers the most (22% each). However, an exactly equal percentage of farmers said that no party, in fact, took care of their interests, a finding that was in sync with the larger narrative of widespread disenchantment and unhappiness within the farming community. 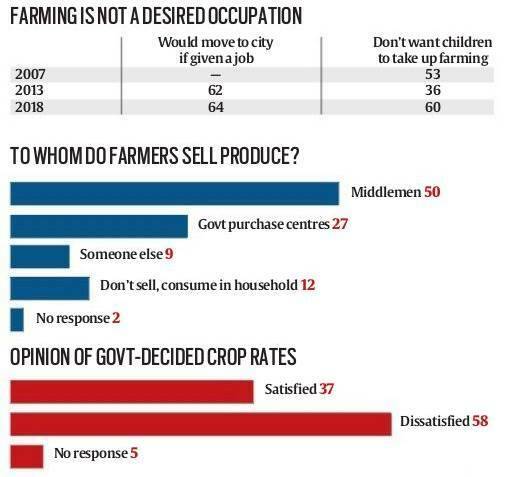 The agrarian distress was underlined by the finding that as many as 64% of farmers would like to leave agriculture and move to a city if they were offered a job there. This percentage was slightly higher than the 62% that a State of Indian Farmers Survey reported in 2013 for the same question. However, the big difference from the 2013 survey was that as many as 60% of farmer respondents in the current survey said they would not like their children to take up farming as the source of livelihood — this was only 36% in 2013. The survey contains findings on deprivation that indicate that despite relatively high levels of economic growth in the last two decades, India continues to suffer from hunger, undernutrition and lack of access to medical treatment when needed. 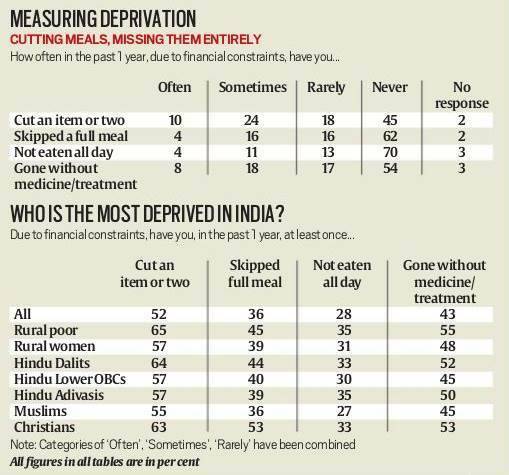 The data show that in the last one year, due to financial constraints or lack of resources, about one in every 10 Indians was forced to cut down on a food item or two in their meals “often”, and 8% of Indians were often unable to buy medicines or seek medical treatment. Every 25th Indian (4%) often went without eating for the entire day. Combining the categories of ‘often’, ‘sometimes’, and ‘rarely’ into ‘having happened’, the survey found that every second person (52%) had consumed less than their usual intake on at least one occasion during the last one year due to financial constraints. Over two-fifths (43%) did not buy medicine when needed at least once, over a third (36%) had skipped a meal at least once, and more than a quarter (28%) had gone without eating the whole day at least once. The marginalised communities are especially susceptible to this kind of hardship. Nearly two out of three Dalits had to cut an item in their meal at least once during the last year, and about two in five Dalits, lower OBCs and Adivasis were forced to skip a full meal at least once. Almost half of all Dalits, Adivasis, and Muslims were not able to buy medicines due to shortage of money at least once. These figures are worse among the poorest in all these communities. Chhattisgarh, Madhya Pradesh, Rajasthan, Uttar Pradesh and Tamil Nadu reported above national average deprivation. In Jharkhand and Chhattisgarh, 55% of respondents reported not eating the whole day at least once due to financial constraints. Medical deprivation was the highest in Odisha — 64% reported that at least once in the last year they had been unable to buy medicines or seek medical treatment when needed.